The total amount of cash recovered in January 2018 was €283,444. This is +9% compared to the previous month. When looking at the table above, it shows how effective each stage of the process is at recovering cash owed to investors and can help you understand why some stages are more effective than others. If you haven’t already read our previous posts on the ‘3-step collection and recovery process’, December’s and January’s post then we would recommend that you check them out first. What happens when a borrower dies within their loan term? Last month, we saw an increase of 168% in the cash recovered in rare cases. This figure has now reduced back to a lower level of €69 total, compared to €10,063 in December. Another stage has been added in the rare cases section this month, did you notice it? Unfortunately, it is inevitable that on the rare occasion someone with a Bondora loan may die within the period of their loan term. Whilst the law related to executing the individuals will in relation to their available assets and liabilities is different in every country, Bondora seeks to work with the executor of the borrower’s estate to secure the repayments due. However, it may come to light that the estate may not contain sufficient assets to repay the obligation. In the event that no recovery is possible, the loan will be written off. Although, we can see from the data that €1,284 was retrieved in this scenario in Estonia. One of the biggest changes seen in January was the amount of cash recovered at the Default & Court stage (Step 2 of the collection process), an impressive 55% increase. 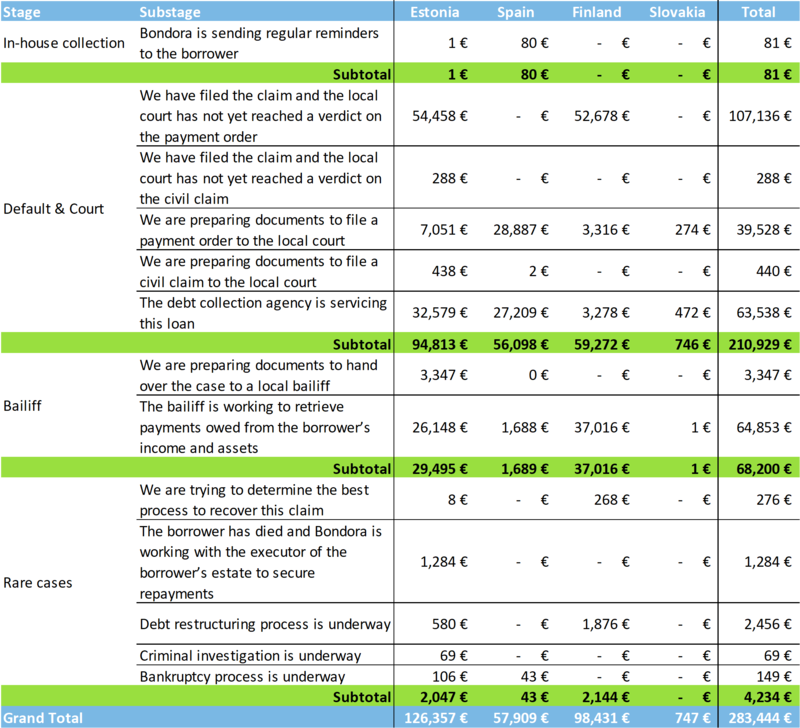 More specifically, this was at the ‘We have filed the claim and the local court has not yet reached a verdict on the payment order’ where €82,462 more was recovered compared to the previous month. Once all cases can automatically be filed to the courts, we expect the cash recovered in the bailiff stage to show the largest amounts across all countries. This is important because it means that we can start to generate a cash flow in a more time-efficient manner for investors.